At the Tropicana Golf & Country Resort, there is a game of golf to be enjoyed no matter day or night. There are two challenging dream courses complete with rolling slopes and sweeping valleys, each designed to the United States Golfers Association specifications,which offer golfing pleasure to champion and amateur golfers alike. The nine-hole East Course and the 18-hole West Course feature strategically located sand and water hazards amidst picturesque holes on the rolling green. The excellent macro and micro drainage system of the courses ensures that players need not delay their games after rain. Game can be resumed a mere 15 minutes even after a heavy, tropical downpour. In addition, the courses are automatically irrigated by a sophisticated, computerised system of sprinklers, which control the volume, spot and duration of water sprayed. As night arrives, there is also no need for keen golfers to abandon their game as 18 holes (nine holes on each course) are lit up for continued play by clusters of non-glare floodlights, a high-tech lighting system is similar to that used in the Barcelona Olympics. Tropicana Golf & Country Resort set out to build a world-class golf course that will be the enjoyment of both avid and amateur golfers. The services of Mr Graham Marsh of the renowned Australian team, Marsh-Watson Pty Ltd, with a string of five-star rated projects in Australia under their belt such as The Vines in Perth and Robina Woods on the Gold Coast, were engaged to design and construct Tropicana’s golf course. 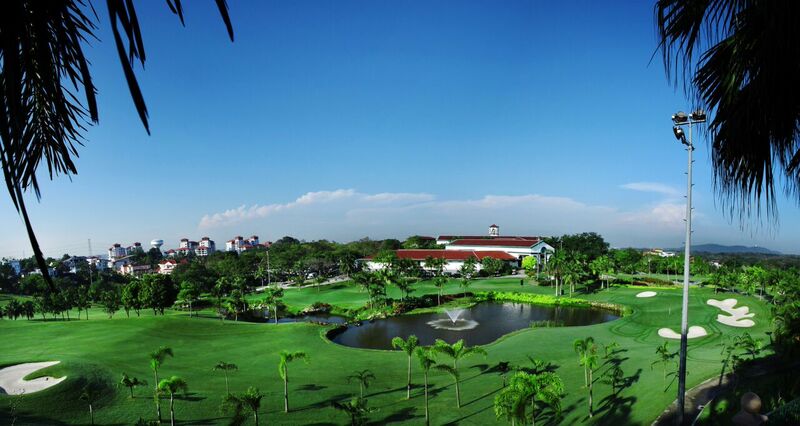 Build upon the natural terrain of a former rubber plantation and at a cost of over RM35 million, the East Course was first opened to great expectations in 1993. Needless to say, the golf course which was said to have been "designed to bring out the best in any player" has met and exceeded these expectations. Many golf veterans have commented that it is indeed a pleasure to play at the Tropicana Golf Course and that it has a special appeal to high handicappers and professionals alike. When golf devotees talk about the famed Tropicana golf course, it is usually the East Course to which they refer. 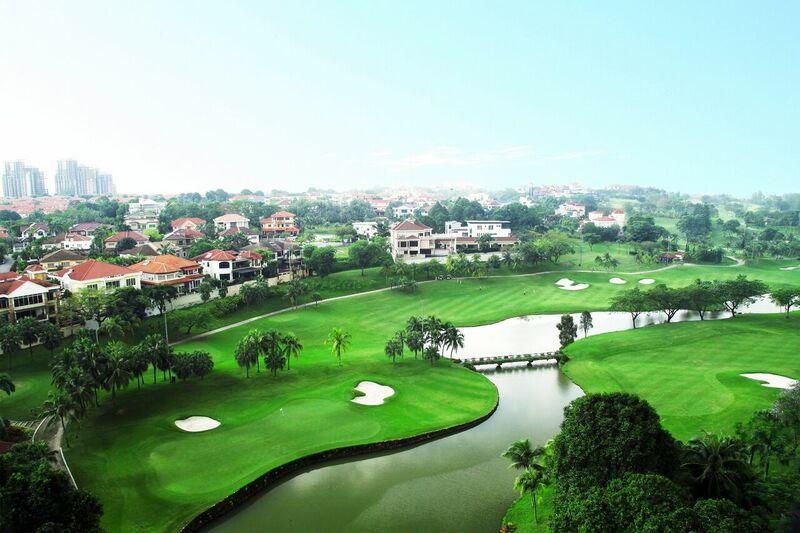 Termed as challenging yet friendly, this nine-hole course is built upon former rubber plantation terrain, which makes it naturally suited for a golf course, and boasts Greenlees Park Couch grass for the fairways and Tifdwarf on the greens. Picturesque landscaping comprising exotic palms and plants complements the rest of the course to please the eye and soothe the mind of golfers at play. 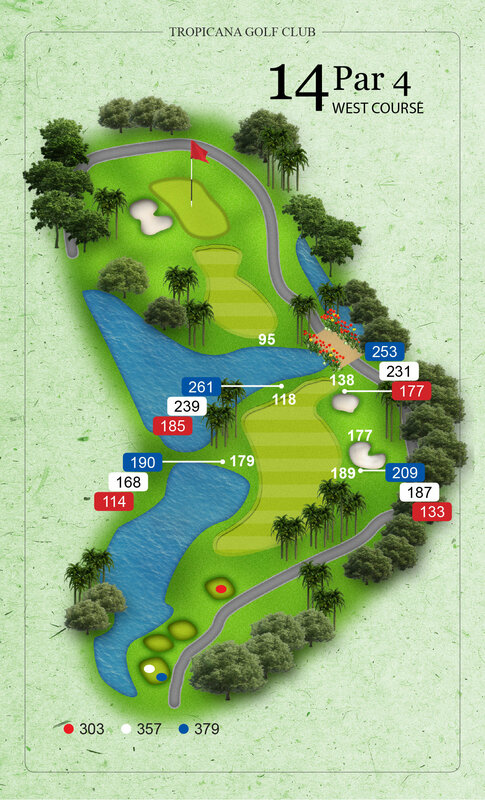 This beautifully challenging Par 4 kicks off your revolutionary golf experience at Tropicana. Framed by a series of water cascades, you will need a good straight tee, which will land you straight on the receptive green. From the tee you will stare down a steep water slope on the left and a strong ridge guarding deep grassy hollows on the right. 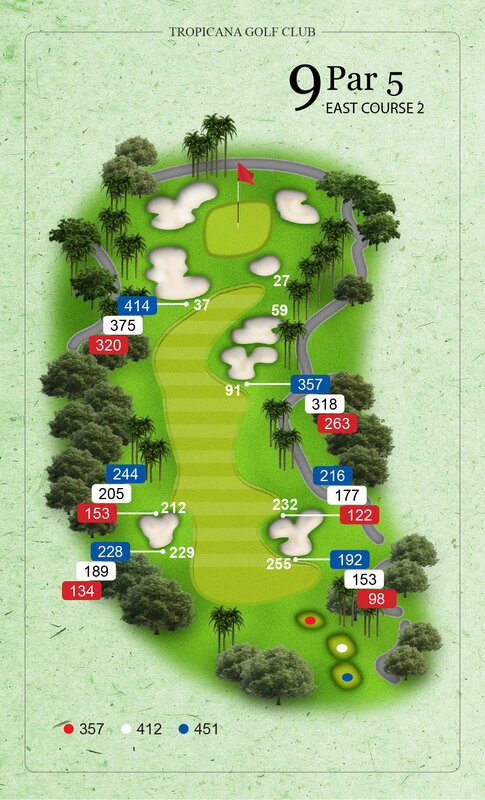 An exciting Par 4 hole, you will need to conquer by favouring accuracy, bearing in mind that the fairway heads downhill towards a well protected green. A medium range iron should put your second shot on the green, but keep a look out for the sand bunkers and grassy hollows surrounding the green after you tee, as well as the water hazard that sits deceptively at the end of the fairway. 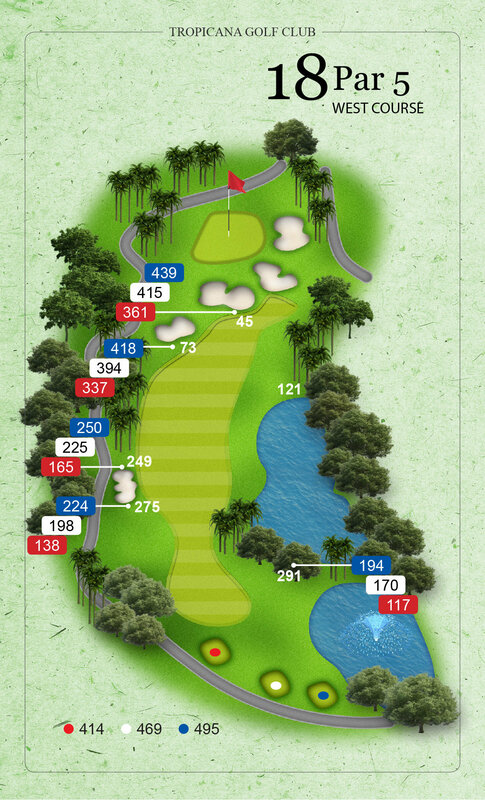 This Par 3 has one of the most scenic views through water cascades and a connected pond, but it also holds quite a challenge as two large bunkers guard the left of the green, and if you go too much to the right you may end up in the grassy hollows which would make it a difficult chip to the pin. 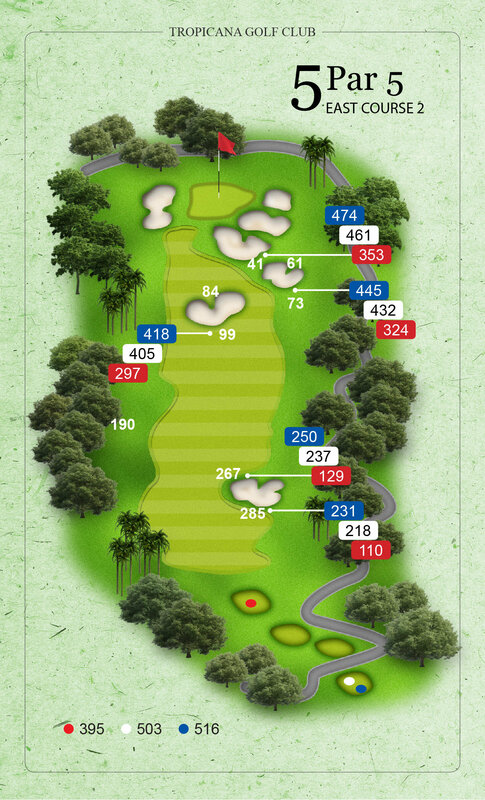 An interesting Par 5 hole with a narrow fairway that slightly doglegs to the left, a drive to the fairway may find the bunkers and a watery grave. 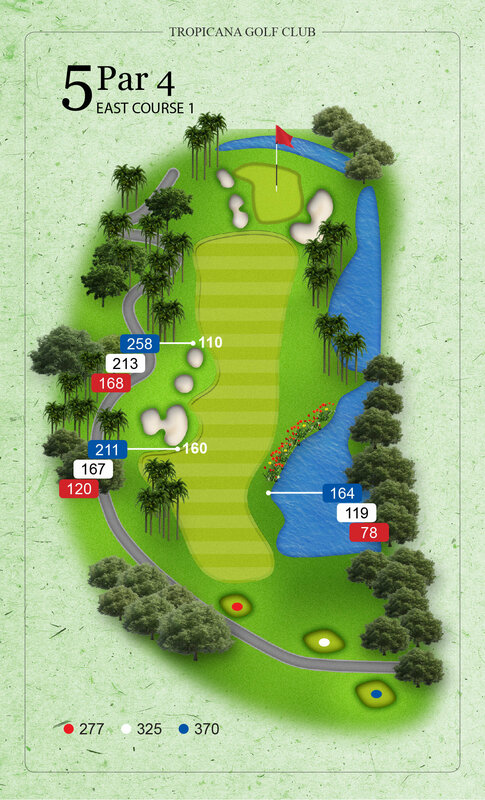 The second lay-up shot should stop just before the lake fronting the green followed by a shot carrying over the lake to meet the well-protected green. 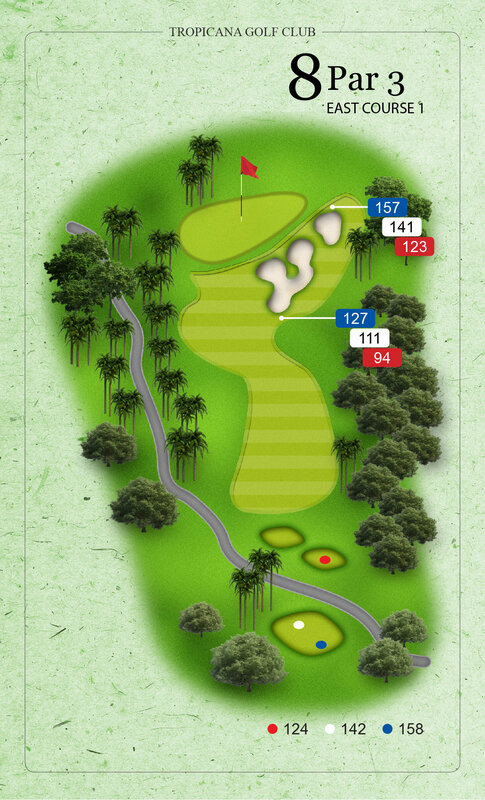 This is one of the more difficult Par 4s on the course that requires pinpoint accuracy and a lot of nerves. From the tee box, you will need to take a narrow shot to avoid the watery grave on the right, while tee shots straying too far left will end up in the flower bed slope or the undulated lie. The trick is to keep the ball in the middle of the fairway on the second approach shot as traps protect both sides of the green and water lurks at the rear. 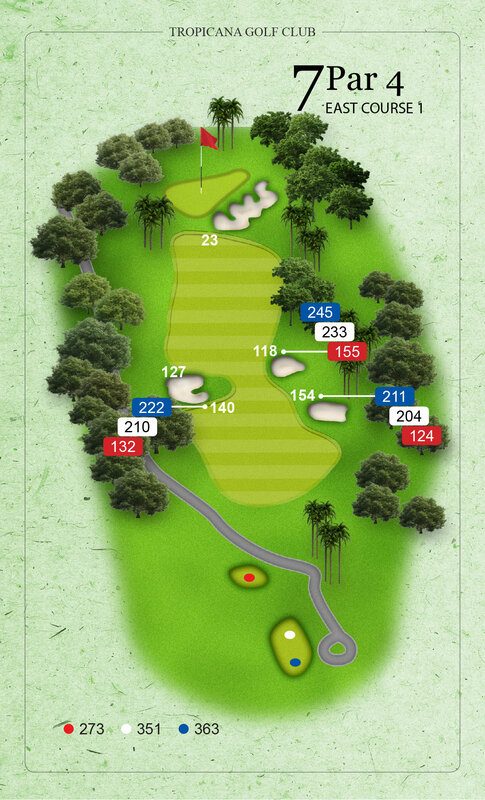 A challenging Par 5 that utilises the lay of the land for best results. The hole slightly doglegs uphill to the left, and a drive to the inside of the dogleg can give you an extra 10 to 20 metre run which will lay you up for your charge at the second lay-up shot just before the green for a better view of the well guarded pin. This is a long uphill Par 4 hole that requires you to keep more to the right to avoid the out of bounds area beyond the fencing on your left. A good drive will ensure an easy approach to a receptive green. Take your irons to the task with this open view downhill Par 3. The challenge is to avoid the two large bunkers guarding the green on your right, but the view from the elevated tee will give you a good view of the fairway as well as the peaceful surroundings. 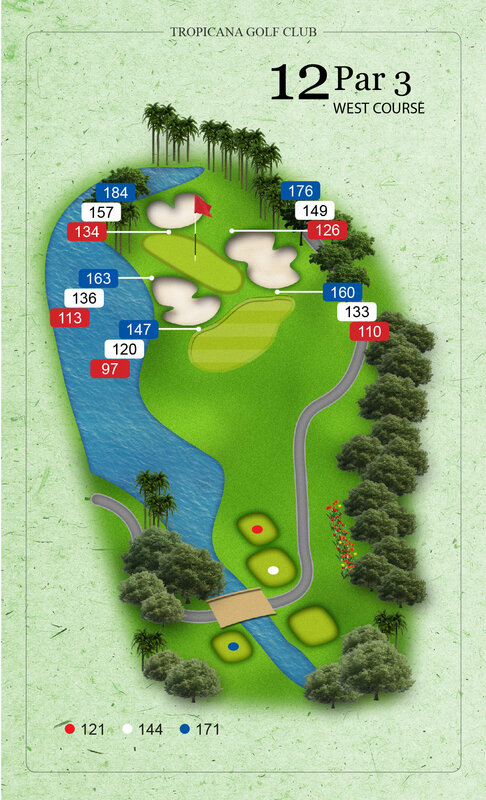 A fitting long Par 4 to make your revolutionary experience an interesting one. 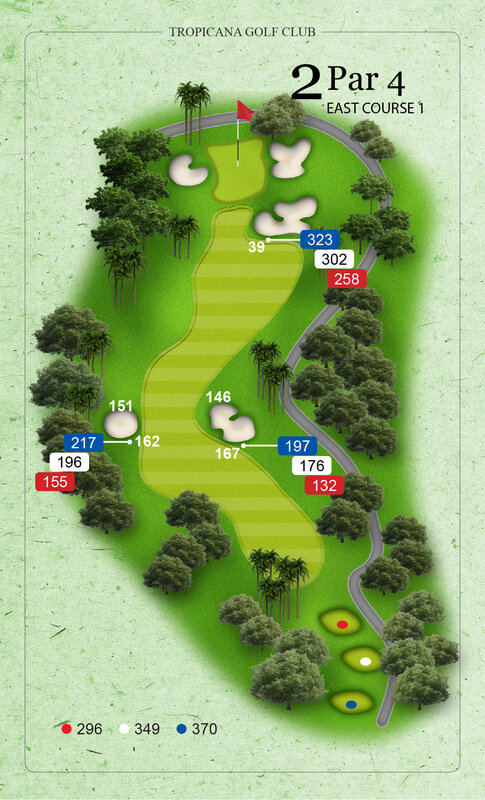 You will need a drive that stays out of the right side fairway trap as trying to reach the green from bunker is quite impossible. 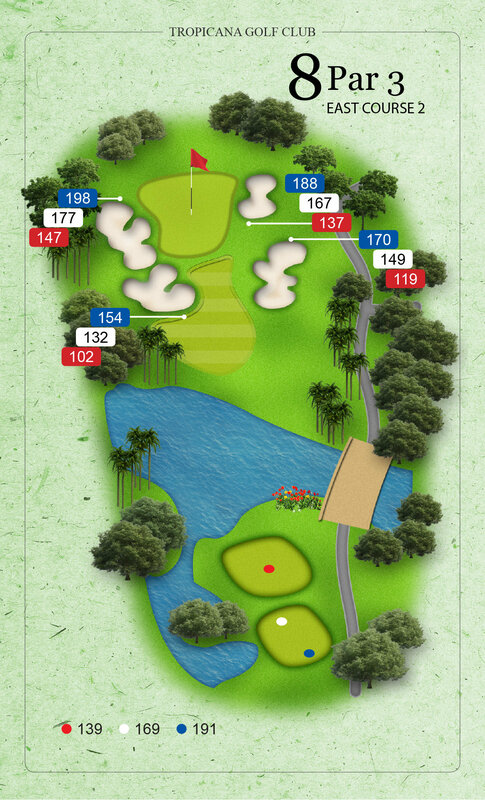 Choose your club well for the approach shot to the green surrounded by water in the front and bunkers on both sides. Sometimes you should take it easy, and this relatively hazard-free Par 4 will allow you just that. Start off safely towards the wide, generous fairway that goes gently downhill and gradually climbs up towards an elevated green protected by a solitary bunker. 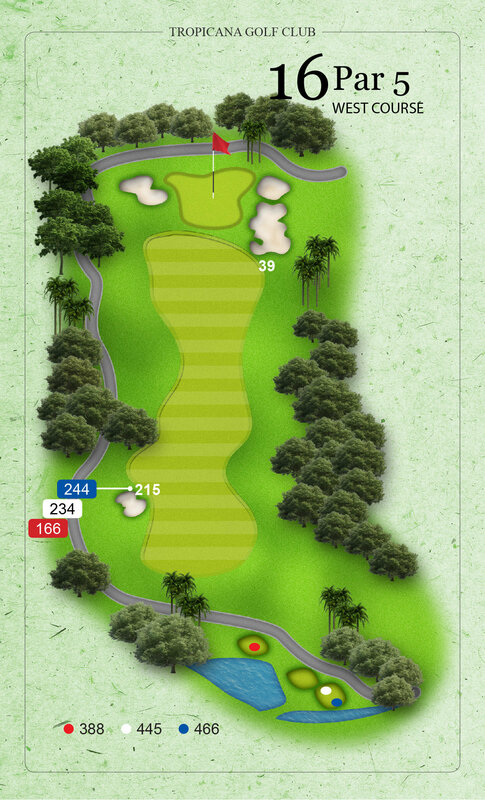 Avoid hook shots to the left, as the view of the green is blocked by trees and an undulating lie, while the out of bounds area lies just beyond the fence on the left. 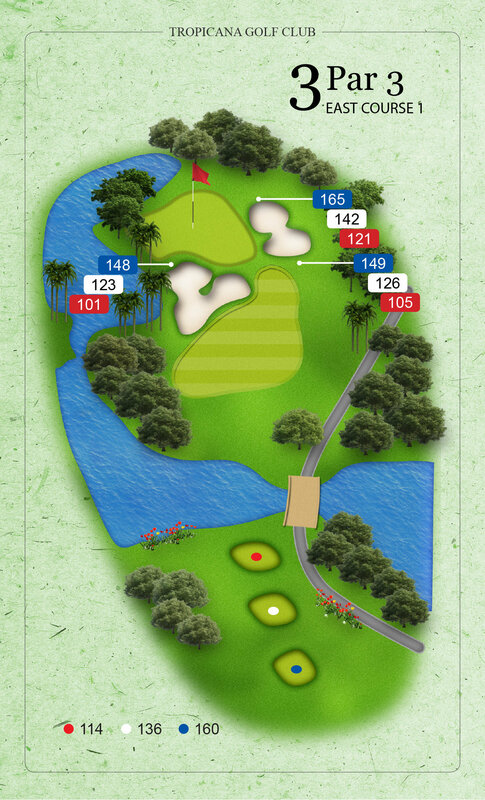 Don’t be deterred by the large lake of this contoured Par 11 that is destined to keep you coming back to Tropicana. Your tee-off shot must carry over the lake and on to a tight landing area guarded by a deep fairway bunker on the inside of the dogleg. Keep your aim in the middle as stray balls to the right on the shrub patch between the stream and the fence on the left is out of bounds. The contoured green is elevated and guarded by greenside bunkers. 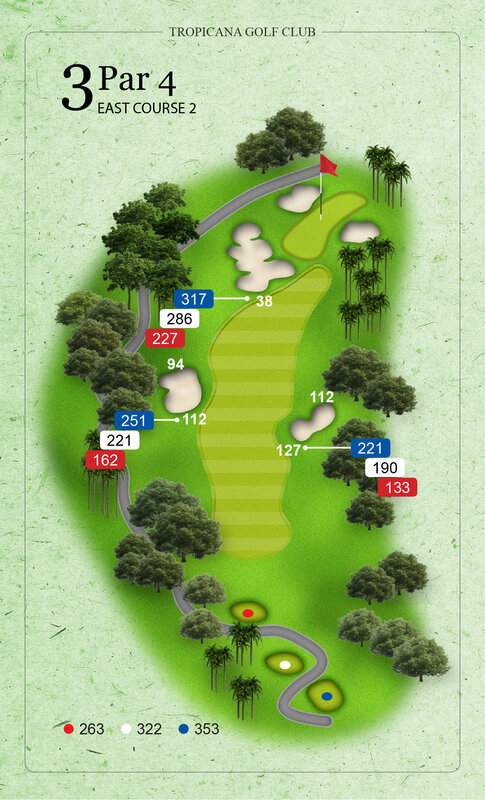 This Par 4 hole doglegs right and features strong undulating fairway shaping that requires a left-handed careful approach. Keep your ball towards the left of the dogleg to avoid the fairway bunker on the inside of the dogleg. The green is elongated and protected by a greenside sand bunker on the front left. The bunkers are here! 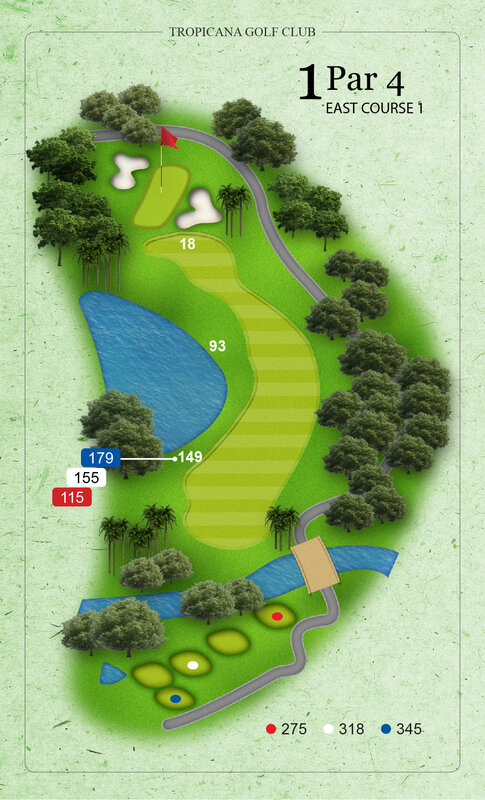 Indeed this short Par 3 will demand an accurate tee-off to a fairly large green guarded by a series of small bunkers. 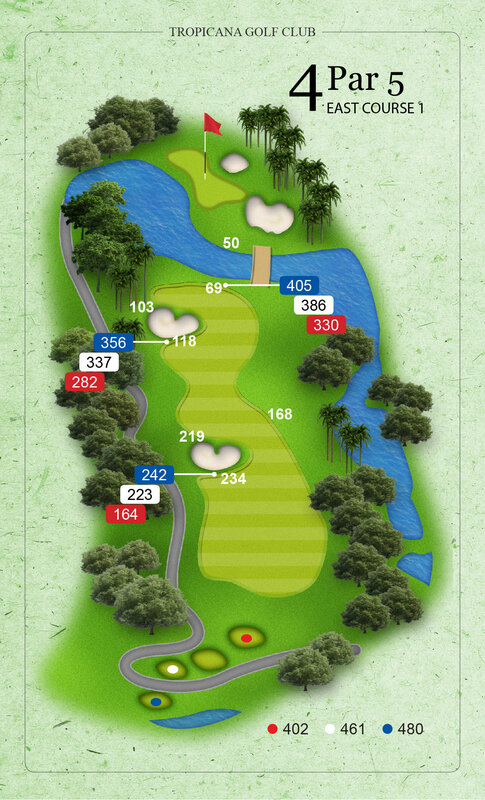 The longest Par 5, which will command plenty of respect on your revolutionary golfing escapade. The ideal drive should be as close as possible to the right side fairway traps, which allow you a clear passage past the next set of fairway bunkers on the left side. 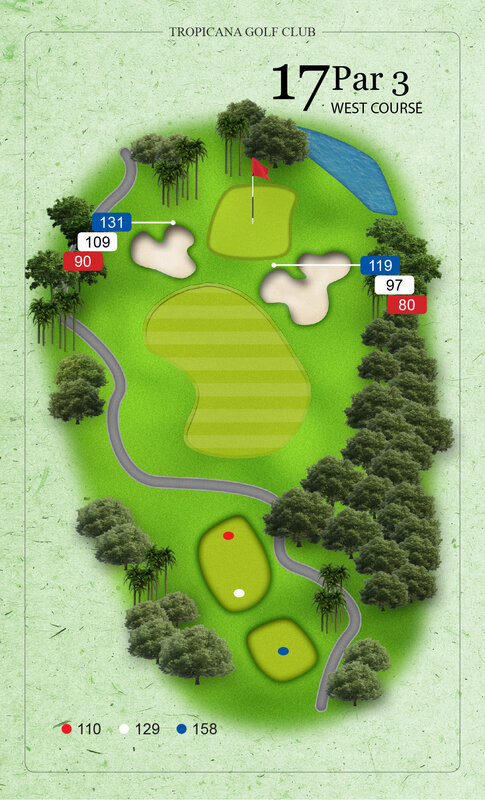 The smart move would be to lay your shots short of the traps, and be rewarded with a short pitch to the green. OB is on the right beyond the fence. 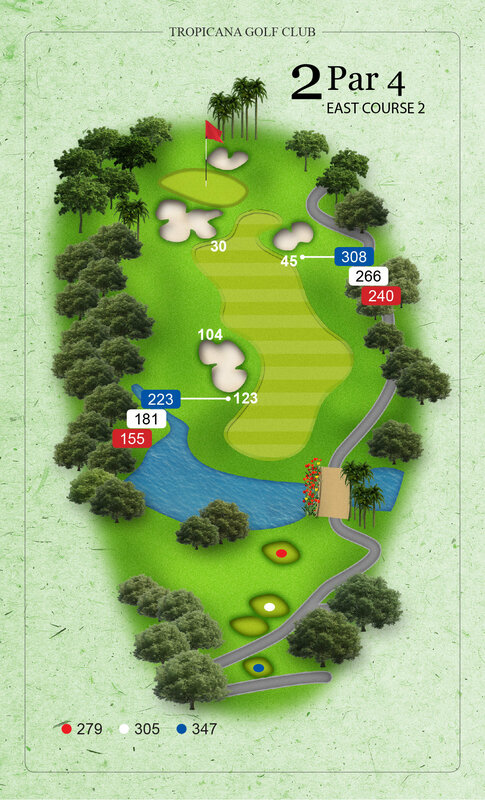 A relatively straight Par 4 hole, you will need two solid shots to reach the green. Any drives finding the sand from the tee will struggle to make four. Green side bunkers in front of the green will pose a greater challenge to the low handicappers. This downhill Par 4 hole will offer the long hitters a challenge but remember to keep the ball around the contours on the right side of the fairway for a short iron home. The left side of the fairway is all trouble with a fairway trap and grassy hollows for any errant pulled tee shots, but keep your fingers crossed on the green which is fringed by two approach bunkers and a series of lakes on the left. A tough Par 3 from the rear tee box. Although out of play, the water and multi-level fairway calls for a careful selection of clubs selection towards the contoured green which is heavily trapped on the left hand side. 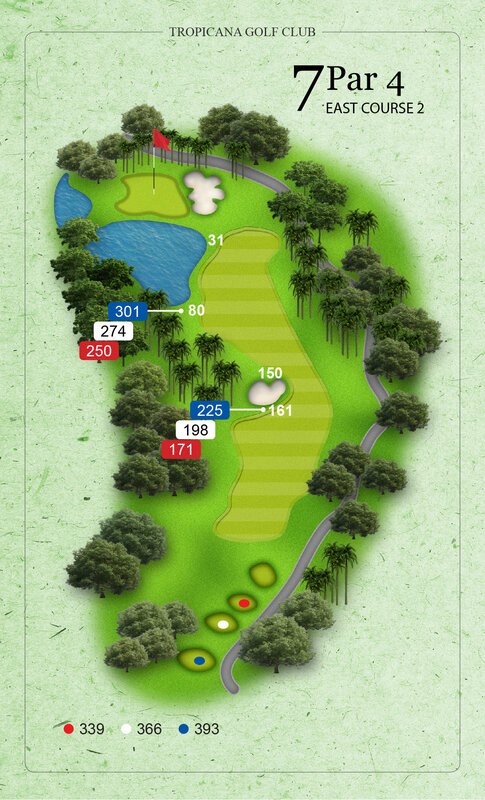 This long Par 5 will entice you and poses quite a challenge. 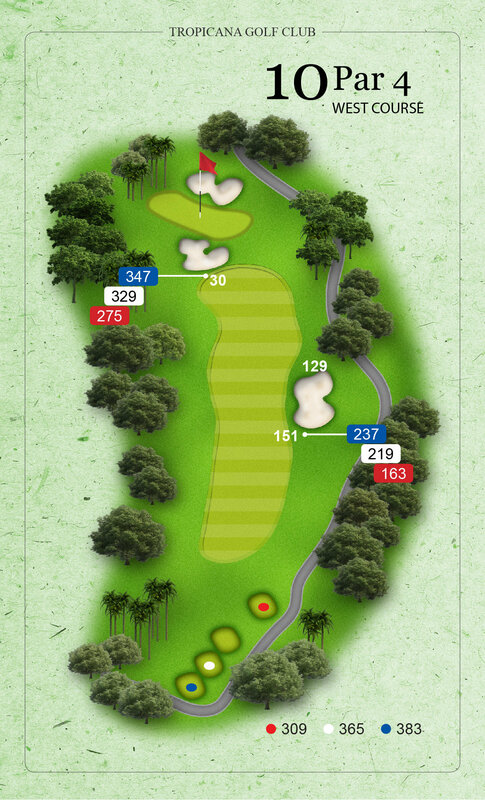 Long straight hitters will be rewarded with a shot home to a deceptive green but the not so brave will lay up for a short iron home onto a long stepped green guarded by a deep grassy hollow. Featuring interesting water hazards, this "user-friendly" West Course nevertheless teases golfers with a mix of waterways, dog-legged fairways and a good distribution of sand traps. Rock formations, casual waterfalls, creeks and various flora makes up the extensive landscaping of the course. 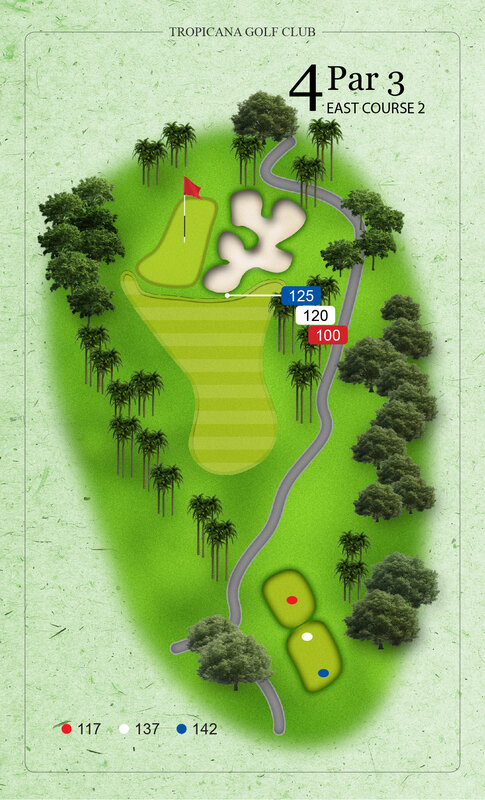 This strong opening Par 4 hole gets us underway on the second leg of your journey through this challenging course. Most drives will run to the left side of the fairway, therefore, the tee shot should be started down the right side to create a clear line into a green guarded by traps on the left. Any drives finding the fairway traps will result in an awkward approach shot. The green is slightly uphill from the driving zone, so approach shots must be hit firmly. 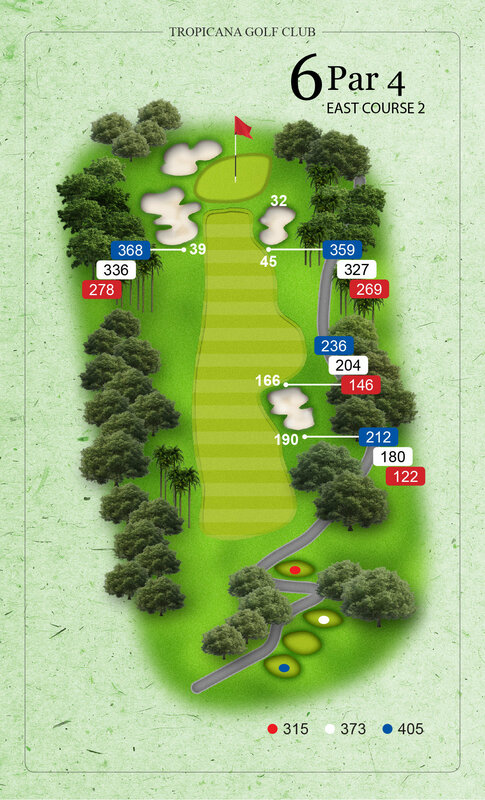 This Par 4 doglegs steeply to the right, so the positioning of the drive is critical in attaining a clear view to the green. The ideal position to be is right of centre of the fairway, close to the trap. Any balls straying too far left from the tee will be directed further away by a step in the fairway. Strong players may consider carrying the trap on the right, promoting a much shorter shot to the green. Beware the water lurking behind the green. The first Par 3 is a beautiful hole with the tees set in amongst the rockwork. Water borders the left side of the hole, while bunkers are scattered around the putting surface. Rear left pin position will prove to be a stern test from the tee. 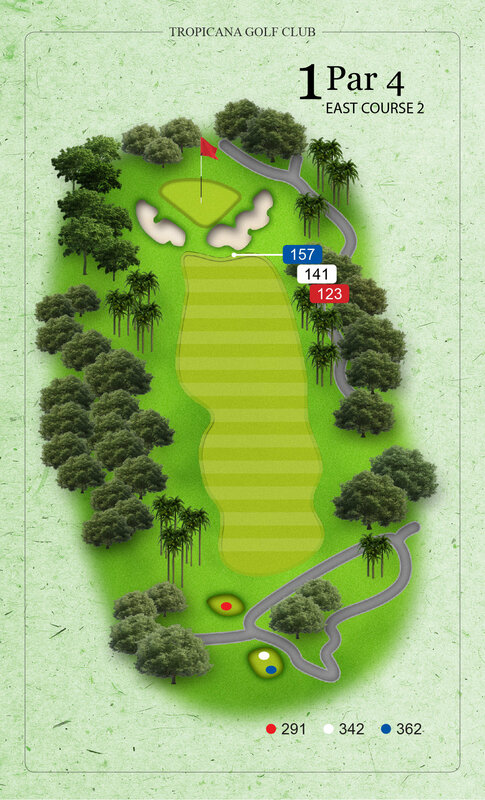 An exciting hole that proves short Par 4s can also be a great challenge. 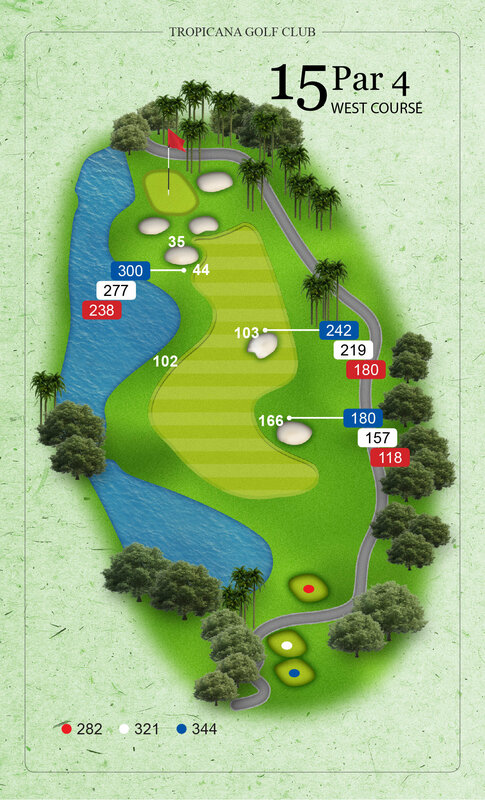 You can either choose to lay up short of the water towards the generous landing zone, resulting in a short iron to the flag or the big hitters can have a go at carrying the water and be rewarded with a short chip to the green. 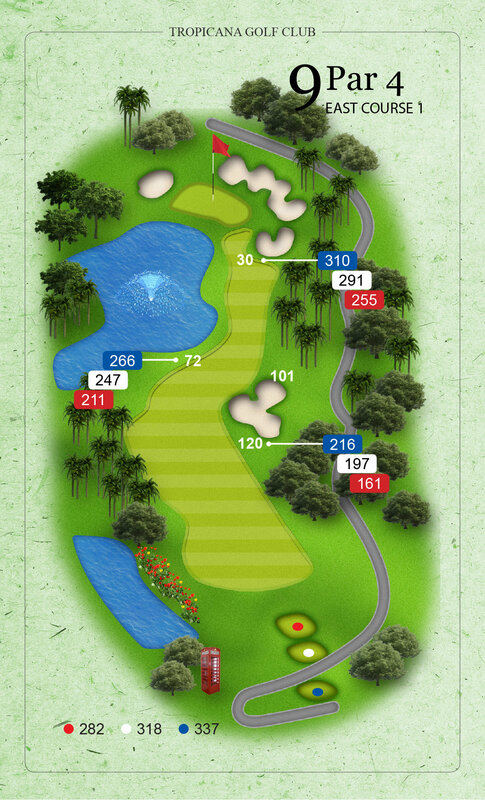 A picturesque golf hole, the Par 4 features a beautiful lake meandering down and cutting the fairway in two. The drive must be played short of the water, as those straying too far away from the lake will find themselves in a fairway trap, which could result in a very difficult approach indeed. A solitary greenish bunker appears on the left of the green and the small ponds lie awake like sentries, on the right. Probably one of the most picturesque holes on the layout, the Par 4 features a fairway that is accompanied by a lake along the entire left edge, whilst the rockwork and a sleeper retaining wall add a rugged character for effect. The water continues to follow the fairway up to the green, but a long expanse of sand creates a "soft penalty" for those entering too close. A long green will again allow for a variety of pin placements with the rear positions providing a keen test. A short but uphill Par 5 with a real estate figuring along the left side of the border, the fairway trap on the left side promotes play away from the homes, however, some deep hollows separate the 9th fairway on the right. There is an opportunity to reach the green in two shots, but much sand awaits those not accurate enough. Players can choose to lay up and leave only a short iron to the pin. 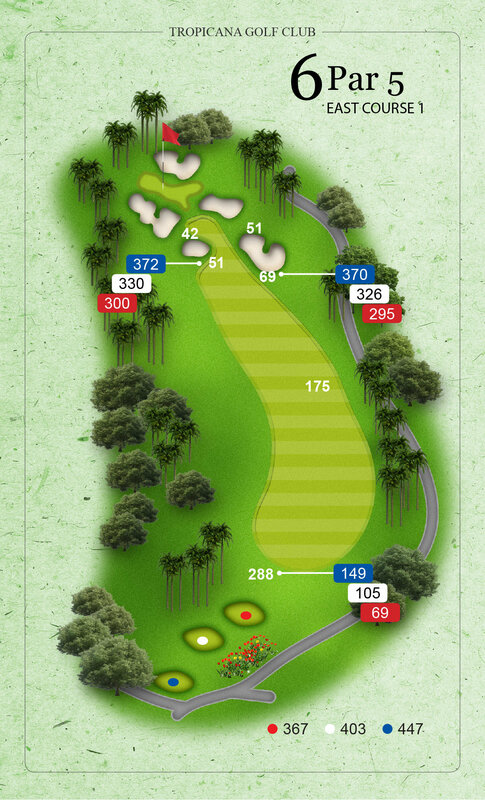 A terrific short Par 3 hole with much undulating terrain between the tee and green, which requires accuracy rather than distance as the target is only small. Numerous greenside traps and grassy hollows lie in wait for those missing the green but don't be shy to take your shot, as players judging the distance correctly will be rewarded with pars and birdies. A rewarding crescendo to your revolutionary Tropicana golfing experience! A memorable Par 5 to complete the West Course with breathtaking views through a series of ponds and water cascades on the right. The finishing touch to your well-played game, the drive should avoid the fairway traps on the left, as it will prove to be the nest line of play. 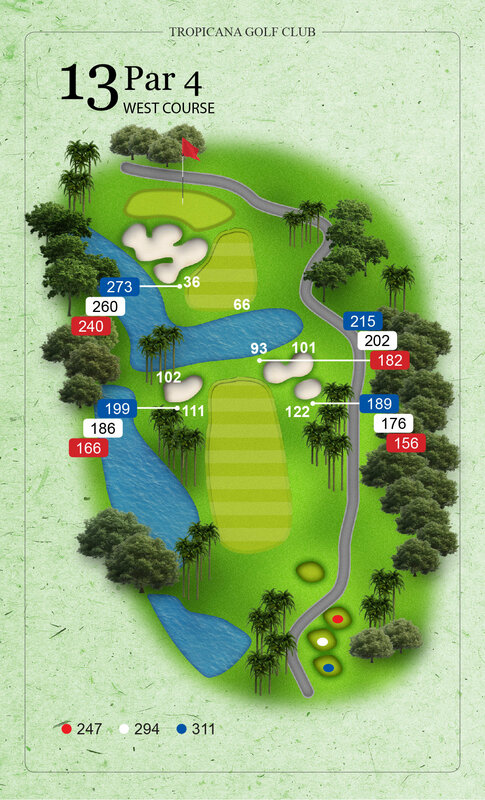 Once again, big hitters will be given the chance to get home in two, but the shorter of the traps will require a very short third to the pin, with the welcoming colonial-style Tropicana clubhouse providing a spectacular backdrop and conclusion to your rewarding game. "This is the only clubhouse in Malaysia that has got everything." – Datuk H.M. Shah, golf veteran of 40 years. Administrative and Computerized Scoring at RM200.00+. Extra meal (breakfast, lunch, Hi-Tea or dinner) for non-golfers at RM60.00 + 6% SST per person. Drinks and snacks consumed at the Halfway Huts or the Clubhouse are to be paid directly by cash or charged onto the master bill. Registration table with registration clerk. Score cards with flight details sticker. Changing room facilities and lockers. P.A. system, microphones, rostrum and prize table at Green Rooms. Deposit upon confirmation – non-refundable deposit of 50% from the tournament cost with the balance 50% to be settled after the game. Golfers must have a Valid National Handicap of 24 & below for men, and 36 & below for ladies and are required to produce the handicap card upon request. Golfers are required to observe the Club’s Rules & Regulations and Dress Code. 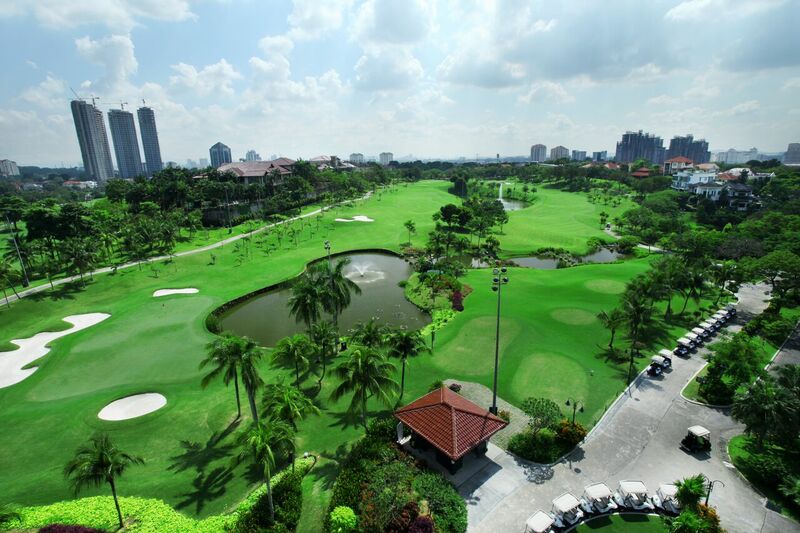 All payment to be made in favour of Tropicana Golf & Country Resort Berhad. Golfers shall be responsible for any damage to private property while playing on the golf course. Players shall undertake to repair, replace, compensate or pay damages inflicted on/to any private property or injuries, or loss of life to any person in the private property, or elsewhere on or around the golf course. Organisers are required to ensure that their invited guest meets the above requirements and take full responsibility in the event of any accident. *Price subject to change without prior notice. *For all golfing enquiries, kindly contact Golf Registration Counter at 03-7804 1531 or fax 03-7804 2089.
for men, and 36 & below for ladies (must tee-off before 2 pm) – weekdays only.management may amend the course assignment in the event of renovation or during competition. below for men, and 36 & below for ladies (must tee-off before 2 pm) – weekdays only. and below. The handicap golfer shall be responsible for the P Handicap golfer. Members must strictly follow the registered tee-off time. - Follow booking turn (Registered time). 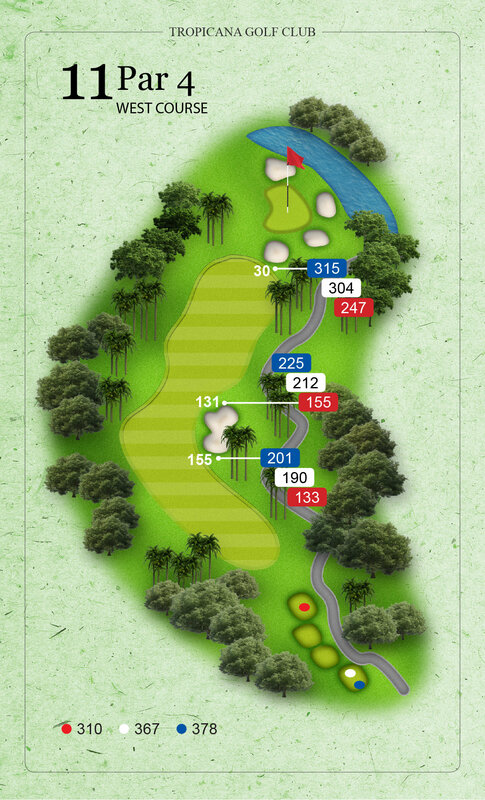 - Alternate tee-off, crossover then follow by new registered flight. 3.3.1 Must book and observe tee-off time. 3.3.2 After 5.00 pm, daily at East 2 Course. 3.3.3 Between 4.30 pm to 5.15 pm at the East 1 or west 3 (No priority). 3.3.2 Saturday and Sunday at the designated course only after 5.00 pm. Weekdays last tee-off before 2.00 pm. 4.2.1 Starting from 9.30 am to 5.00 pm daily. 4.2.2 Members shall make the booking for themselves. 4.2.3 Produce membership cards or numbers. 4.2.4 No booking on behalf of other members is allowed. playing with other principal members or parents. 4.4 Bookings may be made 7 days in advance. 4.5 Cancellation must be made 24 hours before tee-off time. taken within ten minutes of the booked time. which they will lose priority. encouraged to purchase golf insurance coverage. 8) Please do not litter and keep your golf course clean.